By now you know that Fastcall log calls to a Salesforce Task. Missed calls have a red arrow. Inbound and outbound calls will be in your Salesforce reports. For deeper reporting look to our custom object for calls, connections, and connection attempts where we log each leg of an ACD and transferred calls. Assign a user to monitor missed and unknown calls throughout the day. It is important to search for existing records and/or create new leads for each missed call. The user can be dedicated or users can rotate. When an inbound call is received Fastcall will try to automatically match a related record. If we do not find a match, our search option will help the user look for a matching related Lead, Contact etc. If none are found, the user will create a new Lead. Unknown calls are calls without a matching Salesforce record. These inbound calls with no lookup to a Salesforce record should be triaged. These are orphan Tasks. When creating new leads for missed calls, we like using the Lead Status = Lead missed call. Answered calls should use your existing lead status. The user spoke to the contact. You have an option to keep tasks open for missed calls. When a call is answered or missed, and no matching Salesforce record is found, a lead should always be created by the user. If you wish to maintain exceptional data hygiene you need to triage these calls. In the dashboard you can filter the type of missed call: replied/not replied missed calls. If you are working in the widget or dashboard you will find recent calls and the option to search related records. If you are on the Salesforce task, there is a custom button that will search Salesforce using the “from phone number” and if a match is found will create the lookup. Note: The button must be added to the page layout. 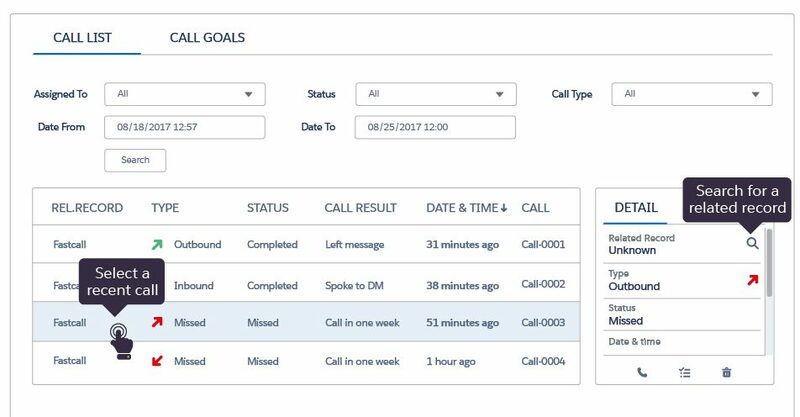 When a call is missed by your user and the lookup is matched by an existing record in Salesforce, the missed call is identified by the task owner and task status. Because there is a lookup to a matching Salesforce record the task is not an orphan. Fastcall makes it easy to reply to these missed calls and will create a lookup between a missed call and the reply call. You create the reply call when returning the call from the widget or the dashboard. You can also SMS reply to a missed call. For unknown missed calls, always create the lead to hold the record before the follow-up call is made. The outbound, follow-up call should only be made from a Salesforce record; from the created lead, or the existing lead. This will create a completed task as an outbound call with a lookup to the record. Though Fastcall allows the user to make a call from our widget, this creates an outbound task with no lookup. When a call is made outside the Salesforce record there is no lookup from the task created. The result is dirty data. 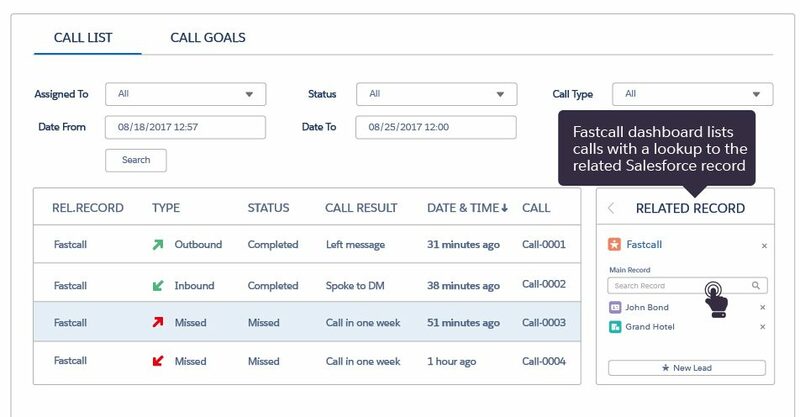 Fastcall will associate a subsequent outbound call to the prior inbound missed call when calling from the widget or dashboard. An alternative is to call from the open task optionally created by the missed call. The open task is already related to the Salesforce record. When calling from an open task, Fastcall will close the task. In this case, the missed call task is overwritten. Fastcall gives both options. Salesforce reports are an alternative to the Fastcall dashboard. Create a report of Fastcall inbound calls. Calls with no matched Salesforce record are your orphan Tasks. Put the report in Console and use as a hot list to triage missed calls. This must be a report because Salesforce does support Tasks in Console or as a list view. When a call is answered – as indicated by a long call duration – but there is no lookup to a related Salesforce record, this indicates that the user who answered the call did not relate the call to an existing Salesforce record or create a new record. The user left the call task as an orphan. Even if you have to listen to the recorded call try to find the name of the caller. Fastcall can set a default status when a lead is created from a missed call. If the created Task turns out to be a junk call, delete it. Or, create a lead named Junk and use this to match any future calls from this caller ID. Fastcall voicemail is available for calls routed to users or calls routed to groups. Voicemail is shown in the widget and is appended to the Salesforce Task in a custom field for recordings. We also have a missed call email. Let’s now talk about ways to reduce missed calls and reduce hangups. Your goal is to reduce wasted or lost ring time to increase the connection rate to your users, and/or increase the pickup rate for voicemail. To do so, you do not want to ring users who are not at their desks. To help reduce wasted ring time Fastcall can auto logout users after missing calls. The Fastcall user panel also shows users their position in the round robin call rotation. This helps the user know her order for call rotation. Recent calls are shown in the Fastcall widget, but only recent calls; not all missed calls. Missed call emails are not the right solution for high volume inbound calls. Emails are for one or two missed calls/day. Fastcall creates custom records for calls, connections, connection attempts and voicemail. Calls can have multiple connections (transferred calls) and calls can have multiple attempts (ACD). See the page for the Fastcall data model for more info. Next, let’s talk about IVR settings to help minimize missed calls. When using the ACD to distribute inbound calls to multiple users. Fastcall has a custom data model used for call logging each “child” ACD leg as belonging to the same “parent” call. See our data model for more detail. You may know that Salesforce tasks can only be owned by a Salesforce user. Fastcall allows the call record (our custom object) to be owned by a Salesforce Queue.